When summer is here and high temperatures are a must there is no other way to escape heat as to find the right swimming pool. Gone are the days when a notion chlorine was synonymous to them, nowadays pools are as sophisticated and beautiful as never before. What is more, very often the pool draws visitors to a resort. I would like to tell you a couple of words about the hottest and most incredible hotel swimming pools. 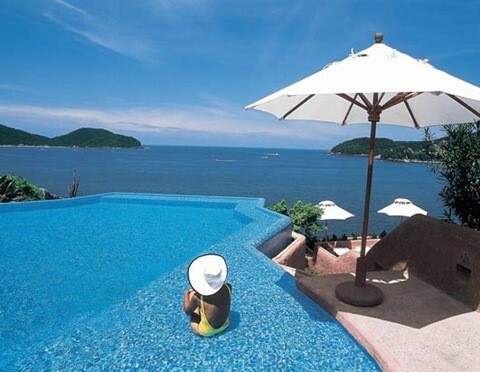 The following freshwater infinity pool offers incredible view onto Mexico’s Zihuatanejo Bay and seems to be an integral part of it. There are special places for sitting and enjoying the views. The hotel is famous for its incredible “infinity” pools, each one big and heated to different temperatures in order to meet the needs of numerous people. The best view is opened from the spectacular private infinity pool in the new 7,000-square-foot presidential suite. The suit boasts a 2,500 square foot terrace where the private pool can be found. It was a real surprise for me to include an Egyptian hotel into the following list. But Le Meredien can be called everything but boring and simple. The main feature of it is a 68,889-square-foot swimming pool, and it snakes around the hotel, providing numerous places for entertainment and private activities. This pool considered to be the largest pool in the Middle East. This pool features approximately 700,000 gallons of water and 23,000 square feet and it is called the largest hotel pool in the continental U.S. It draws attention of numerous celebrities and designers which adore making their shows in it. It is one the greatest nature pools made by a person. It uses the whole advantages of Iceland’s grand geothermal peculiarities. The following pool offers an incredible views and swimming right in the middle lava fields (and snow in the winter).